Have you ever spent hours making a cheesecake and then have it crack? Cracks can be caused either by over beating the batter and/or because of too much moisture being lost as the cheesecake bakes (or over bakes). To avoid cracks always mix the ingredients on a low speed as, unlike a batter cake, you do not want to incorporate a lot of air into the batter, you only want to beat the ingredients until they are nice and smooth. To avoid over baking: while you want the cheesecake to be firm, if you shake the pan gently, it should still wobble (a little), and the center will still look a little wet. This can be alarming if you are used to making traditional cakes because this outcome is usually to be avoided. Although the center may not look fully baked, once it cools it will firm up and be the correct consistency. It is also tres importante to note that cheesecakes are cakes that should not to be eaten straight away (try your best), they should be cooled and then be refrigerated for several hours (preferably overnight if possible), so the flavors have time to blend and the texture to become firm. Cheesecakes store very well and can also be frozen. To freeze, place the cooled cheesecake on a baking pan and freeze, uncovered, until firm. Remove the cheesecake from the freezer, wrap it in heavy duty aluminum foil and place in a freezer bag. Seal and return to freezer. It can be frozen for several months. When you want to eat your cheesecake simply thaw the uncovered cheesecake in the refrigerator overnight and voila you have a cheesecake ready to go. Having a cheesecake in the freezer is great if you are hosting a dinner party because you can bake it weeks ahead and simply remove it from the freezer the night before. Cranberry Filling: In a medium sized saucepan, place cranberries, sugar, and water. Then, over medium-high heat, cook the ingredients until boiling, stirring to dissolve the sugar. Reduce the heat to medium low and gently boil the filling, stirring often to prevent the filling from burning, until it becomes thick and syrupy and reduced to about 2 cups (takes about 20-30 minutes). Remove from heat, stir in the zest, and let cool completely before using ( could even be done the day before). 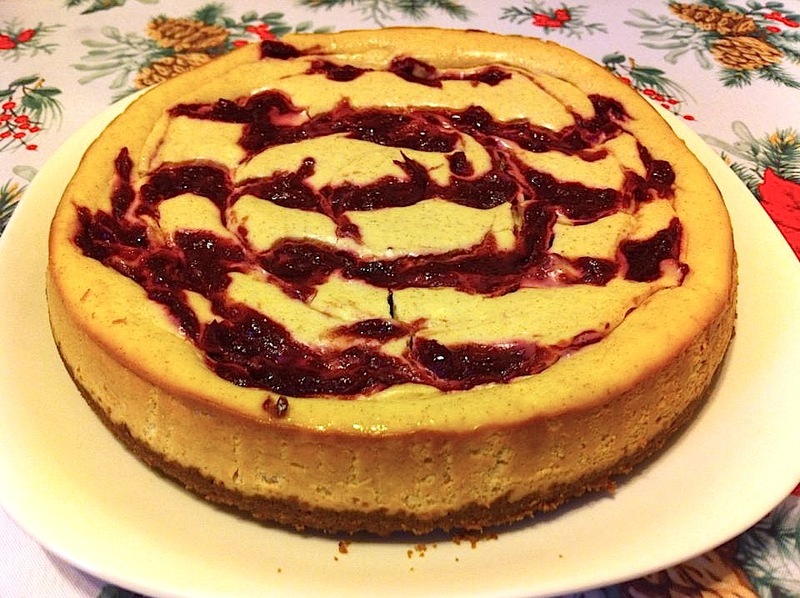 Cranberry Swirl Cheesecake: Grease, or spray with a non stick vegetable spray, a 9 inch (23 cm) round springform pan. Preheat oven to 350 degrees and place the oven rack in the center of the oven. For Crust: In a medium sized bowl combine the graham cracker crumbs, sugar, and melted butter. Press the crumbs evenly over the bottom and about 1 inch (2.5 cm) up the sides of the springform pan. Cover and refrigerate while you make the filling. For Filling: In the bowl of your electric mixer (can use a hand mixer) place the cream cheese, sugar, and flour. Beat on medium speed until smooth (about 2 minutes), scraping down the bowl as needed. Add the eggs, one at a time, beating well (about 30 seconds) after each addition. 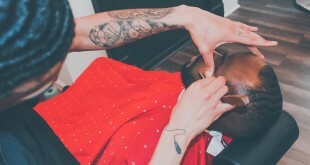 Scrap down the sides of the bowl. Add the cream and vanilla extract and beat until incorporated. Remove the crust from the refrigerator and pour half the cheesecake filling into the pan. Take one-half cup of the cranberry filling and place spoonfuls over the cheesecake batter and then swirl gently with a knife. Top with the remaining cheesecake batter. Spoon another one-half cup of the cranberry filling over the cheesecake batter and swirl gently with a knife. (You will have leftover cranberry filling which can be served with the baked cheesecake) Place the cheesecake pan on a larger baking pan (to catch any drips) and place in the oven. Bake for 15 minutes and then lower the oven temperature to 250 degrees and continue to bake for another 60 to 70 minutes or until firm and only the center of the cheesecake looks a little wet and wobbly. Remove from oven and carefully run a knife or spatula around the inside edge of pan to loosen the cheesecake (this will help prevent the surface from cracking as it cools). Let the cheesecake cool before covering with plastic wrap and refrigerating. Cheesecake tastes best after being refrigerated at least eight hours or overnight, so resist the urge to eat it right away Makes a good Saturday afternoon project to enjoy on Sunday evening.